One of the biggest changes in maritime safety communica-tions since the invention of radio began to unfold last month. 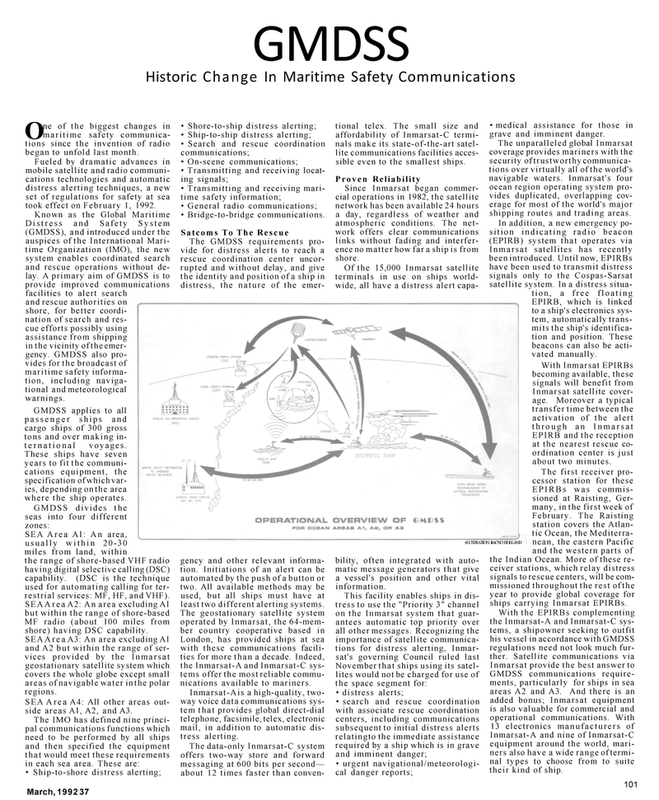 Fueled by dramatic advances in mobile satellite and radio communi- cations technologies and automatic distress alerting techniques, a new set of regulations for safety at sea took effect on February 1, 1992. Distress and Safety System (GMDSS), and introduced under the auspices of the International Mari- time Organization (IMO), the new system enables coordinated search and rescue operations without de- lay. A primary aim of GMDSS is to provide improved communications facilities to alert search and rescue authorities on shore, for better coordi- nation of search and res- cue efforts possibly using assistance from shipping in the vicinity of the emer- gency. GMDSS also pro- vides for the broadcast of maritime safety informa- tion, including naviga- tional and meteorological warnings. GMDSS applies to all passenger ships and cargo ships of 300 gross tons and over making in- ternational voyages. These ships have seven years to fit the communi- cations equipment, the specification of which var- ies, depending on the area where the ship operates. SEA Area Al: An area, usually within 20-30 miles from land, within the range of shore-based VHF radio having digital selective calling (DSC) capability. (DSC is the technique used for automating calling for ter- restrial services: MF, HF, and VHF). MF radio (about 100 miles from shore) having DSC capability. SEA Area A3: An area excluding Al and A2 but within the range of ser- vices provided by the Inmarsat geostationary satellite system which covers the whole globe except small areas of navigable water in the polar regions. SEA Area A4: All other areas out- side areas Al, A2, and A3. The IMO has defined nine princi- pal communications functions which need to be performed by all ships and then specified the equipment that would meet these requirements in each sea area. These are: • Ship-to-shore distress alerting; • Shore-to-ship distress alerting; • Ship-to-ship distress alerting; • Search and rescue coordination communications; • On-scene communications; • Transmitting and receiving locat- ing signals; • Transmitting and receiving mari- time safety information; • General radio communications; • Bridge-to-bridge communications. The GMDSS requirements pro- vide for distress alerts to reach a rescue coordination center uncor- rupted and without delay, and give the identity and position of a ship in distress, the nature of the emer- tional telex. The small size and affordability of Inmarsat-C termi- nals make its state-of-the-art satel- lite communications facilities acces- sible even to the smallest ships. Since Inmarsat began commer- cial operations in 1982, the satellite network has been available 24 hours a day, regardless of weather and atmospheric conditions. The net- work offers clear communications links without fading and interfer- ence no matter how far a ship is from shore. Of the 15,000 Inmarsat satellite terminals in use on ships world- wide, all have a distress alert capa- gency and other relevant informa- tion. Initiations of an alert can be automated by the push of a button or two. All available methods may be used, but all ships must have at least two different alerting systems. London, has provided ships at sea with these communications facili- ties for more than a decade. Indeed, the Inmarsat-A and Inmarsat-C sys- tems offer the most reliable commu- nications available to mariners. Inmarsat-Ais a high-quality, two- way voice data communications sys- tem that provides global direct-dial telephone, facsimile, telex, electronic mail, in addition to automatic dis- tress alerting. The data-only Inmarsat-C system offers two-way store and forward messaging at 600 bits per second— about 12 times faster than conven- bility, often integrated with auto- matic message generators that give a vessel's position and other vital information. November that ships using its satel- lites would not be charged for use of the space segment for: • distress alerts; • search and rescue coordination with associate rescue coordination centers, including communications subsequent to initial distress alerts relatingto the immediate assistance required by a ship which is in grave and imminent danger; • urgent navigational/meteorologi- cal danger reports; • medical assistance for those in grave and imminent danger. The unparalleled global Inmarsat coverage provides mariners with the security of trustworthy communica- tions over virtually all of the world's navigable waters. Inmarsat's four ocean region operating system pro- vides duplicated, overlapping cov- erage for most of the world's major shipping routes and trading areas. EPIRB, which is linked to a ship's electronics sys- tem, automatically trans- mits the ship's identifica- tion and position. These beacons can also be acti- vated manually. EPIRB and the reception at the nearest rescue co- ordination center is just about two minutes. February. The Raisting station covers the Atlan- tic Ocean, the Mediterra- nean, the eastern Pacific and the western parts of the Indian Ocean. More of these re- ceiver stations, which relay distress signals to rescue centers, will be com- missioned throughout the rest of the year to provide global coverage for ships carrying Inmarsat EPIRBs.